Latest News: AP ICET 2019 Notification Released. Online Application will be Commenced from 27th February to 27th March 2019. Go Below to Check Complete Details About APICET Examination. 1.6.1 How to fill AP ICET Application Form? APICET is known as Andhra Pradesh Integrated Common Entrance Test. AP ICET is examined & administrated by the Sri Venkateswara University, Tirupati on behalf of AP State Council of Higher Education. AP ICET 2019 Notification has been released on 20th February 2019 by SVU Tirupati. The Online Andhra Pradesh ICET 2019 Application is going to be started on 26th February. Aspirants must complete the AP ICET 2019 Apply Online Process on before 27th March (Without Late Fee). Otherwise, candidates have to submit the late fee to apply for the AP Integrated Common Entrance Test 2019 Notification. Candidates can obtain the complete Andhra Pradesh ICET 2019 Time Table on following sections. Aspirants can apply for the AP ICET 2019 from this page also. We have provided the direct link for the AP ICET Online Apply 2019. Examination Conducting Institute Sri Venkateswara University, Tirupati. Type of Test Online Test. AP Government on behalf of APSCHE issued this AP ICET Notification 2019 for the aspirants who have aimed for being PG Courses. Andhra Pradesh ICET Exam will be conducted by the Sri Venkateswara University for the academic year 2019 – 20. This AP ICET Exam is mainly conducted for providing Admissions to various Technical & Management Colleges located in Andhra Pradesh. Candidates who are eligible for MCA and MBA Courses can apply for the AP ICET 2019 before the last date from sche.ap.gov.in. The Closing date AP ICET 2019 Online Application without Late Fee is 27/03/2019. Every year, Andhra Pradesh Government organize various Common Entrance Examinations for different courses. Now it is going to announce ICET 2019 Exam Dates for the aspirants who are pursuing Bachelors Degree. Students who show interest in joining Post Graduation can grab this opportunity. AP Government conducts this ICET Exam every year after bifurcation of AP and Telangana. Now it is known as AP ICET. This year it has given the responsibility to the Sri Venkateswara University. So, check the AP ICET Notification 2019 details and apply online. ICET Exam is the common Entrance Test conduct for the students aiming for the MCA and MBA Courses. This exam is valid only for the colleges located in Andhra Pradesh. This test is taken after completion of a Bachelor’s Degree in any stream. For this year 2019-20, SVU released the ICET 2019 Notification for providing admissions to Post Graduation Courses. AP ICET Notification 2019 and Online Application is available on the official site. Candidates can verify the other details of ICET 2019 like ICET Application Dates, Exam Dates, ICET Admit Card, etc. on our site. Check sche.ap.gov.in for more updates about the Andhra Pradesh ICET 2019 Exam. The candidates can apply for this AP ICET Entrance Exam 2019 for this year on before the due date. AP Government inviting applications from the candidates who show interest in becoming Post Graduates in Technical and Management Courses. Students who have completed their Degree Examination or pursuing Degree can apply this APSCHE ICET 2019 Exam. Based on ICET Score/ ICET Rank they will get the admissions in various colleges. Eligibility Conditions for the students appearing for the APSCHE ICET 2019 are given below. Applicants of ICET Entrance Exam 2019 should attain the following Eligibility as their minimum qualification. Based on the AP ICET 2019 Notification, we have provided the Educational Requirements. For MBA: Candidates should complete the Bachelors Degree Examination of minimum 3 years duration with at least 50% marks and 45% marks in case of SC/ST reserved categories in the qualifying examination. For MCA: Aspirants should possess a Bachelors Degree Examination of minimum 3 years duration with at least 50% marks & 45% marks for SC/ST reserved categories in the qualifying examination with Mathematics at 10+2 level. 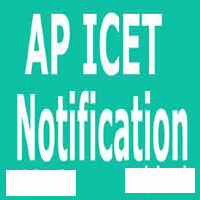 AP ICET Notification 20th February 2019. Last date for submitting the online application 27th March 2019. The release of Preliminary Key May 2019. Candidates applying for AP ICET 2019 should pay the application fee of Rs.550/- before the last date. Application Fee depends on the date of submission of ICET Application. The candidates can refer the Andhra Pradesh ICET Registration Process to save your time. Step by step process to apply online for the AP ICET 2019 Exam given in detail. How to fill AP ICET Application Form? Register yourself by entering necessary details. Log in using Id and Password. Take a printout of it for further usage. Download the AP ICET Notification, ICET User Guide, and the Integrated Common Entrance Test Instruction Booklet from below links. AP ICET syllabus is also provided for your better preparation. Aspirants can get the ICET Exam Syllabus 2019 & AP ICET 2019 Exam Pattern from our site. The ICET PG Admission Test 2019 Syllabus helps you for ICET Exam Preparation. Click the link for getting ICET Exam 2019 Syllabus and Exam Pattern. Aspirants can get the APICET Hall Ticket at the official site of AP ICET Board. Sri Venkateswara University, Visakhapatnam releases the AP ICET 2019 Admit Card few days before the last date. Candidates who have applied for the ICET Exam on or before the last date can get the ICET Exam Hall Ticket 2019 at the official site. You can also Download ICET Admit Card 2019 probably in the month of May 2019. We will also update the direct link for downloading AP ICET 2019 Admit Card. AP ICET Results 2019 will be announced by AP Government once the valuation of AP ICET 2019 Exam is completed. Candidates who have attended ICET Exam conducted by AU can check the results at the official site. Aspirants can get full details regarding AP ICET 2019 Exam on this page. We will also provide the direct link to the AP ICET Result 2019 on our site. Stay Tune to our site for more updates. We will also provide the direct link to the AP ICET Result 2019 on our site. Stay Tune to our site for more updates. Actually I wanted to select the first preference as YSR KADAPA .As there was no that select drop down I selected Prakasham district Chirala and Ongole temporarily .But as per the dates given by the government ,the editing options of preferences will be started from today i.e., 5-4-17 but still it is not reverting. And I would like to know the steps for editing fields of preferences. Actually I wanted to select my local town kurnool As there was no kurnooI select option i select hyderbad ,kadapa and some else temporarily .its more difficult to womens face these problem even if kurnool not means i am not attend to icet exam .But as per the dates given by the government ,the editing options of preferences will be started from today i.e., 5-4-17 but still it is not reverting. And I would like to know the steps for editing fields of preferences. Respected Sir my name is begum.iam not feeling well so i cant apply for apicet but last date is over.so please extend the apicet date to apply.please give me opportunity to apply. I was completed my fee payment but I was unable submit my application form, so what I hav to do to complete the procedure. Now should I pay 1000 rs or can i pay late fee of 500. Ap I cet online application when Realesed 2018 out in date. I am not qualified last year ICET exam . Can I apply for present year..? I have a doubt.What should i fill in the Major Group Subjects of the Qualifying Exam *? I completed B.Tech in Electronics and Communication Engineering. ApIcet Exam is online or offline.? shall I have to pay the counselling fees online before the certification verification. shall I have ro pay the counselling fees online before attending to the certification verification?